The City Palace Museum is the jewel in the crown of the Udaipur City Palace Complex. It is here that you can immerse yourself in the history of the Maharanas of Mewar, and really get a feel for their culture and how royalty lived. The sprawling museum is actually a series of palaces, including the Mardana Mahal (palace for the royal men) and Zenana Mahal (palace for the royal women). Construction on the City Palace started in 1559, making it the oldest part of the City Palace Complex. The various rulers continued the work over four and a half centuries, in a number of phases, giving rise to the Mughal and British influences in the palace architecture. In 1969, the City Palace was opened to the public as the City Palace Museum. This was done out of necessity, in order to generate income and maintain the building after India became a democracy, and royal rulers had to give up their states and fend for themselves. The Museum is now overseen by the Maharana of Mewar Charitable Foundation. The annual World Living Heritage Festival, which takes place at the City Place, is also an initiative of this foundation to preserve Indian heritage and culture. The current custodian of the House of Mewar, Shriji Arvind Singh Mewar, hasn't merely been content with restoring the City Palace to its former glory. Ongoing projects are underway to develop it into a world class museum. Once such project is the exhibition of priceless royal family photographs. The interior of the Museum is also adorned with priceless artwork, which documents royal history before Udaipur got its first camera in 1857. A collection of personal portraits of Shriji Arvind Singh Mewar is on display as well. Recently, the world's first silver museum and gallery of royal musical instruments were added. Being the largest part of the Udaipur City Palace Complex, the City Palace Museum stretches 33 meters high, 333 meters long, and 90 meters wide. Exploring the museum is like negotiating your way through a maze. There's a good reason for this. It was designed to hinder enemy attack. The Udaipur City Palace Museum is open daily from 9.30 a.m. to 5.30 p.m, except on the day of the Holi festival. Tickets cost 300 rupees for adults and 100 rupees for children. Audio guides can be hired for 200 rupees. Take this visual tour of the Udaipur City Palace Museum to discover some of its highlights. The main entrance to the Udaipur City Palace Complex is known as Badi Pol. After passing through the entrance, you'll find yourself in a courtyard. On the east wall, there are eight stone ornamental arches. Known as "torans", these arches were constructed by Rana Jagat Singh I, during the period 1628 to 1652. They mark the spot where, on special occasions such as visits to holy places, the rulers were weighted against gold or silver. The equivalent value was distributed to the needy. Head through Tripoliya, the triple arched gate made of marble, and you'll reach Manek Chowk. Manek Chowk is perhaps the most recognizable feature of the Udaipur City Palace Museum. This huge grassy courtyard fronts the main entrance to the Mardana Mahal, Palace of Kings. Constructed by Rana Karan Singhji from 1620 to 1628, Manek Chowk was used for public meetings, ceremonial processions, horse cavalry, elephant parades, and other festivals. The courtyard now has a beautifully laid out Mughal style garden, created in 1992. To this day, it's still used by the Mewar royal family for festivals and special celebrations. The main entrance to the Palace building can be seen on the left of the photo. It's adorned with the Royal Crest of the House of Mewar. On the crest is a Rajput warrior and Bhil tribal, along with the rising sun. The motto is, "The Almighty protect those who stand steadfast in upholding righteousness". The sun symbol represents Surya the Sun God, whom the Maharanas of Mewar draw their linage from. To the right of the palace building is the triple arched gate, known as Tripoliya. It was built in 1711, almost 100 years after Manek Chowk and Badi Pol (the big entrance), by Rana Sangram Singhji II. Manek Chowk has very much stepped into the modern age now. There are book, clothing, and souvenir shops, as well as the Palki Khana restaurant. A sound and light show is also held there every evening. Find out more information about the Mewar Sound and Light Show, and ticket options. However, with a little imagination, you can picture the days of old. A row of low level openings can be seen where the shopping arcade now lies. They housed elephants and horses. Elephants also used to be tied near the car park, where there are elephant beds and posts. Palanquins (covered hand carried chairs) were kept where the Palki Khana restaurant is now located. If you're looking for a regal wedding venue, it's possible to get married in Manek Chowk. After walking through the entrance to the Palace of Kings and Udaipur City Palace Museum, the Assembly Hall opens to Ganesh Chowk. At the east end, you'll find Ganesh Deodhi -- an ornate idol of Lord Ganesh, the remover of obstacles and Lord of success. The idol, sculptured from marble, was made by Rana Karan Singhji in 1620. The fine glass inlay work around it is absolutely superb. From here, the staircase climbs upwards to Rajya Angan, the royal courtyard. Of note, on the top of the staircase is the famous painting of Bapa Rawal, the founder of the Mewar Dynasty in 734. He is pictured accepting the trusteeship of the kingdom from his guru, Harit Rashi. Inside the Rajya Angan (royal courtyard) of the Udaipur City Palace Complex is a gallery devoted to the legendary warrior Maharana Pratap and his horse Chetak. The gallery displays the original armor and weapons used by Maharana Pratap and Chetak during the great battle of Haldi Ghati in 1576, between the Rajputs and Mughals. What's particularly fascinating is the elephant-like trunk worn by the horse. It served to disguise the horse as an elephant, to help avoid malicious attacks from other sword wielding elephants during the battle. Incredibly, elephants fought by holding mardana swords in their their trunks and slashing the enemy with them. It was a wound from one of these swords that unfortunately killed Chetak, during the battle of Haldi Ghati. Legend has it that the horse reared up high and planted its hooves on the forehead of Imperial Mughal Commander Man Singh's elephant, while Maharana Pratap courageously attempted to slay him with a lance. Man Singh managed to duck, and the blow killed the mahout (elephant driver) instead. The horse was critically wounded in the melee that followed. Badi Mahal, known as the Garden Palace, is the highest point in the Udaipur City Palace Museum. 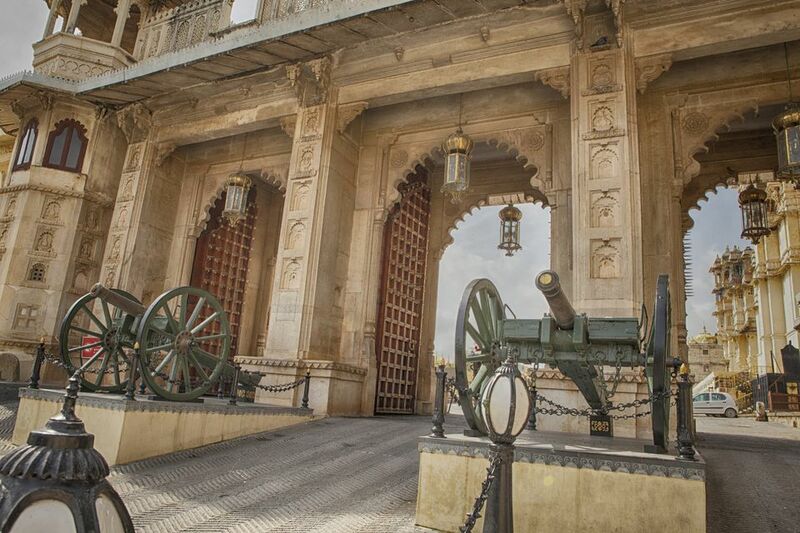 It was built during the reign of Rana Amar Singh II, in 1699. Its 104 intricately carved pillars have been made out of local marble. On the ceiling are cleverly fixed marble tiles, highlighting the amazing skill and craftsmanship of the local artisans. Back in time, Badi Mahal was used for royal banquets on special occasions such as Holi, Diwali, Dussehra, birthdays of royal family members, and in honor of visiting dignitaries. What makes Badi Mahal unique is its location. Despite being the highest point in the palace, it is actually at ground level. This has enabled plant life to flourish there. The courtyard is full of large shady trees, and is a peaceful place to relax and take in the palace surroundings. Its height also provides a great vantage point for viewing the town and Lake Pichola. Badi Chitrashali Chowk lies between the courtyards of Badi Mahal and Mor Chowk, in the Udaipur City Palace Museum. It was constructed by Rana Sangram Singhji II, during 1710-1734. The blue Chinese tiles, colored glass, and wall murals make Badi Chitrashali Chowk a bright and cheery place to be. Indeed, it was used as an entertainment space by the kings. Music and dance performances, and private parties were held there. Badi Chitrashali Chowk is a particularly memorable part of the Udaipur City Palace because of its mesmerizing views. 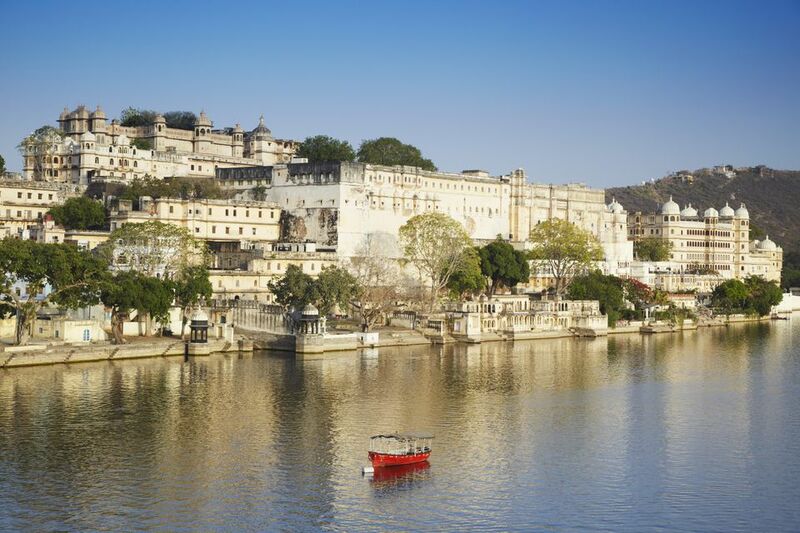 Step out onto the balcony on one side and be greeted by a panoramic vista across the city of Udaipur. Peer through a window on the other side, and you'll be looking right at the Lake Palace hotel and Jag Mandir on Lake Pichola. It's magical! The ornate Mor Chowk (Peacock Courtyard) is often referred to as the most spectacular courtyard of the Udaipur City Palace Museum. Five peacocks decorate the courtyard, which is also covered with beautiful glass inlay work. The kings held special audiences and dinners there. Mor Chowk was constructed during the reign of Rana Karan Singhji. However, the glass inlay work and peacocks were added later, by Maharana Sajjan Singhji during 1874 to 1884. An astonishing 5,000 pieces of mosaic tiles have been used in creating the works of art. The higher wall in the east of the courtyard sustained a great deal of weather damage over the years. In 2004, local artisans commenced restoring it and took 14 months to complete the task. Mor Chowk is the last area in the Mardana Mahal (Palace of Kings). From here, a narrow passage will take you to the other half of the palace -- the Zenana Mahal (Queen's Palace). It's also possible to get married in Mor Chowk. An impressive part of the Zenana Mahal (Queen's Palace) is an open pavilion called Chowmukha. The Queen used to hold audiences here, with other royal ladies and ladies-in-waiting of the royal court, during special occasions and festivals. Banquets and other celebrations are still held there. Chowmukha was built by Rana Sangram Singhji II during his reign from 1710-1734. The dome on top of the pavilion was added to commemorate the 1999-2000 millennium, and is known as the Millennium Dome. To the east of the courtyard is the Osara, where royal weddings are solemnized. You can get married in the Zenana Mahal as well. Inside the Zenana Mahal, it's possible to walk through the queen's chambers. The rooms have been beautifully restored and feature arts and crafts, frescoes, balconies, and alcoves. There's even a swing! Possibly the most ornate and opulent part of the City Palace Museum, Kanch ki Burj is one of the many structures added by Manarana Karan Singhji, during his brief reign from 1620 to 1628. The exquisite dome ceiling of this small chamber is covered in glass and mirrors. Head through the antique ivory doors to Moti Mahal (Pearl Palace), and you'll find yourself surrounded by mirrored walls and stained glass windows. It creates an astonishing array of reflections. This section was also built by Maharana Karan Singhji and used as his private residence. Maharana Jawan Singhji added to the ornamentation 200 years later. The captivating City Palace Museum galleries are filled with priceless regal memorabilia. Two of the most important ones are the Silver Gallery and Music Gallery. The Silver Gallery contains numerous precious pieces of silverware used by the royal household. The highlights include a crib for newborn babies, chariot to carry religious idols when taken out in procession, a horse cart, and mandap pavilion for wedding ceremonies. On display in the Symphony of Mewar Music Gallery, located in the Zenana Mahal, are many antique musical instruments belonging to Mewar kings. As you exit the Udaipur City Palace Museum you'll pass though Toran Pol, a gateway which leads from Moti Chowk (where the main entrance to the Zenana Mahal is located) into Manek Chowk. It was constructed by Maharana Karan Singhji. The structure hanging in front of the Toran Pol is traditionally touched by the royal bridegroom with his sword, before entering the bride's house on his wedding evening.